To Kick off this year's event, the Committee enthusiastically welcomes the arrival of Shadow Nation. Arriving the evening of June 24th, after traveling from California, New Mexixo and Texas, Shadow Nation's crew despite being road weary hung out and exchanged ideas with some of the Committee members. All were greeted by the Thunderbeings. The 25th promised to be a busy day of running around making preparations for the follwoing day's events; the day wrapped up with the Committee planning meeting and dinner. The Committee met with the community and introduced the Shadow Nation crew. 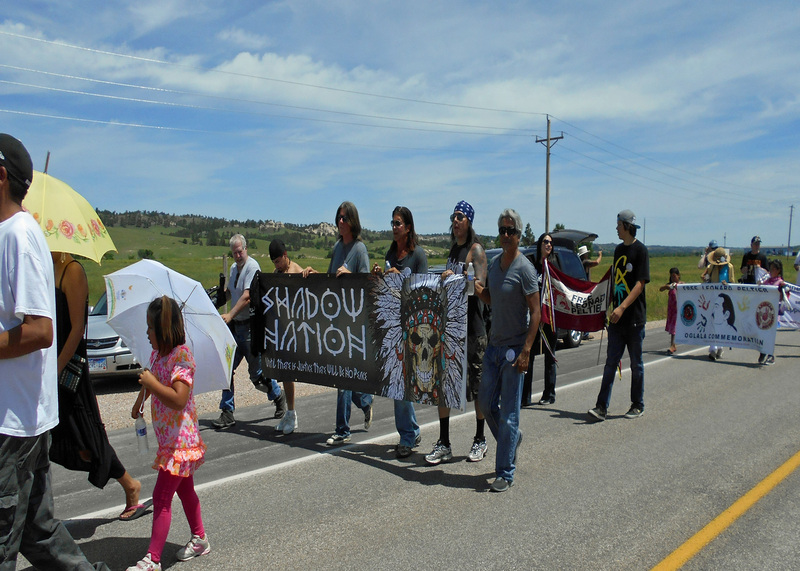 Shadow Nation members introduced themselves to the community and discussed their plans to film issues relvant to the people of Pine Ridge. This meeting and meal concluded with a clear agenda and hopes of a safe and successful event. We had a good turnout at the Little Family Cemetery, well in excess of 100+ attendes. 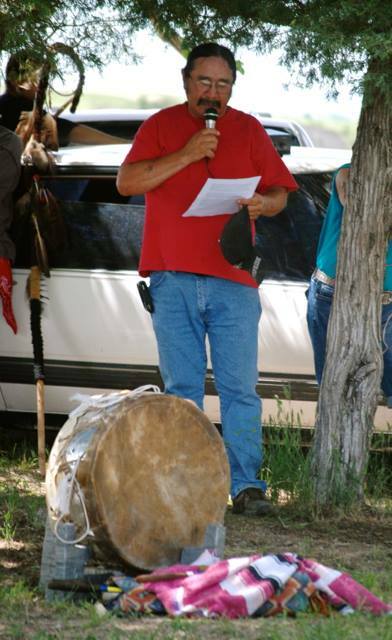 Prayers and words were shared by Billy Good Voice Elk & Guy Dull Knife. The drum presented honor songs for the occassion. We visited with old friends and became acquainted with those we hope will be new ones. Many of the concert performers participated in the walk, the Shadow Nation band carried their banner, and arriving in the early morning hours from Texas, with very little rest, The Black Owk Society: Pte, Ryan, Kelly and Alicia rolled in to join us for the march and shared much needed water with the walkers. 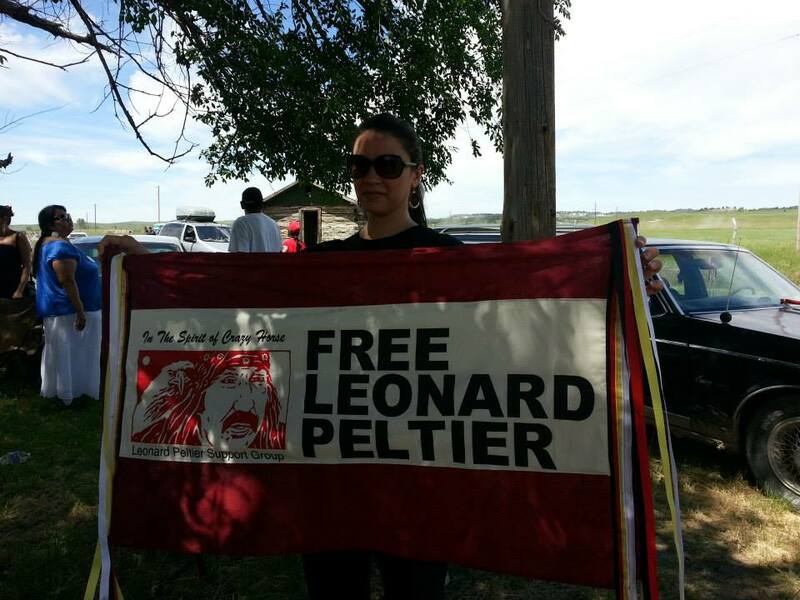 In celebrating the first ever official Leoanrd Peltier Day, many came out to celebrate, pay their respects and honor the hisstoric day. The temps not as bad as last year's when the horses left shoe impressions in the hot asphalt was nevertheless warm and sunny. Elk Nation led the march with honor songs, followed by the staff bearers and the walkers. 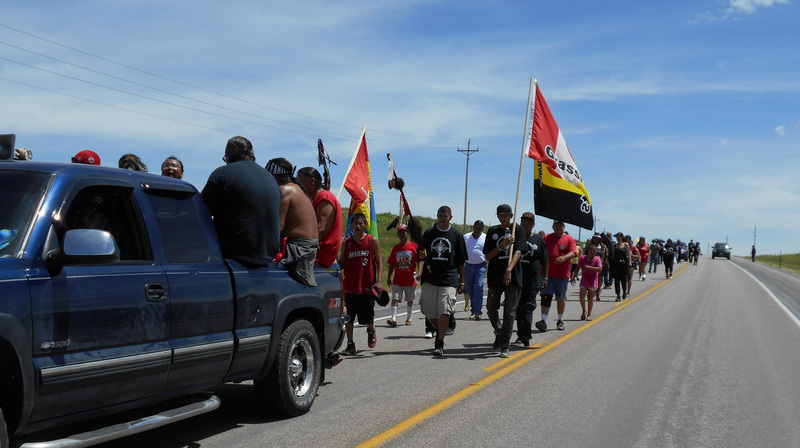 The line was roughly a mile long in length to include the drum, walkers, and the cars carrying many of the elders anc children. 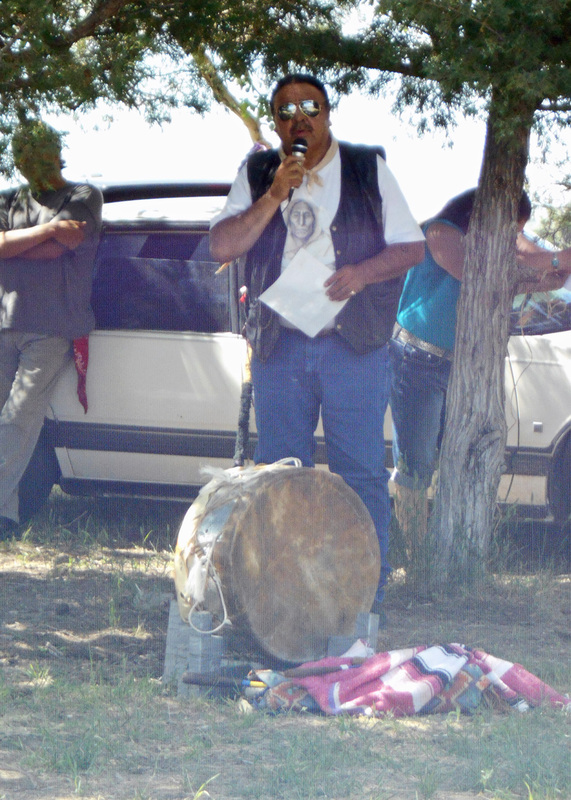 Upon arriving at the Jumping Bull property, the walkerrs were met by Tribal Vice President, Tom Poor Bear. 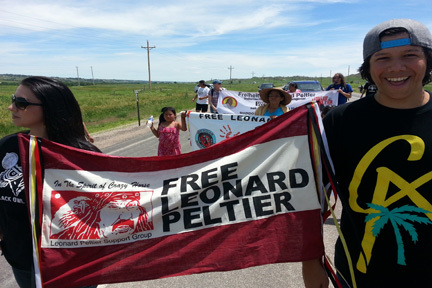 He began by reading the Leonard Peltier Day Proclamation signed by him and the Tribal Preseident Bryan Brewer. 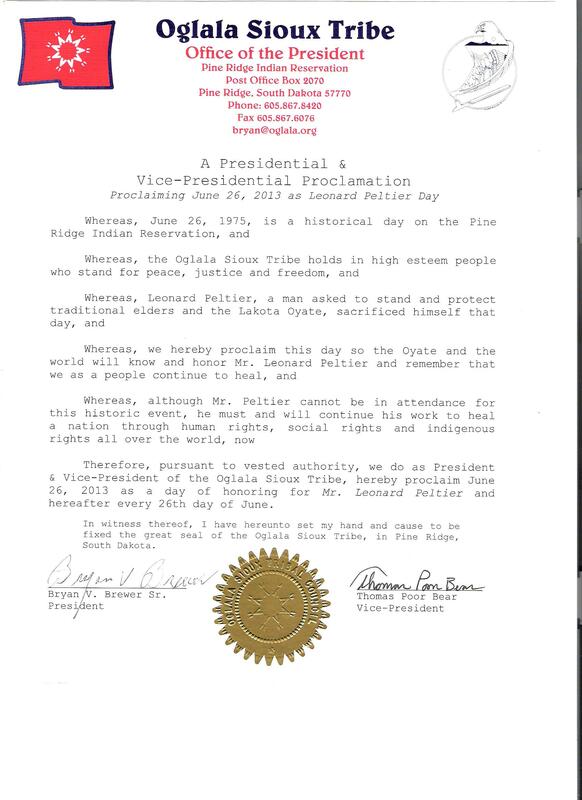 The proclamation names June 26th as Leonard Peltier Day and shall remain so in perpetuity. Ivas Long Visitor welcomes everyone and read Leonard's statement. Leonard's words were shared with everyone in attendance. A brief history of the events of June 26th, 38 years prior was related as well as the lasting impact of that day which so affects many still. Keeping things moving. Billy Good Voice Elk, served as the emcee. Our thanks go to the Stanley Star Come Out family and Pizza Hut for providing a delicious meal at the Jumping Bull property. Following the meal was a presentation of the memorial cakes. 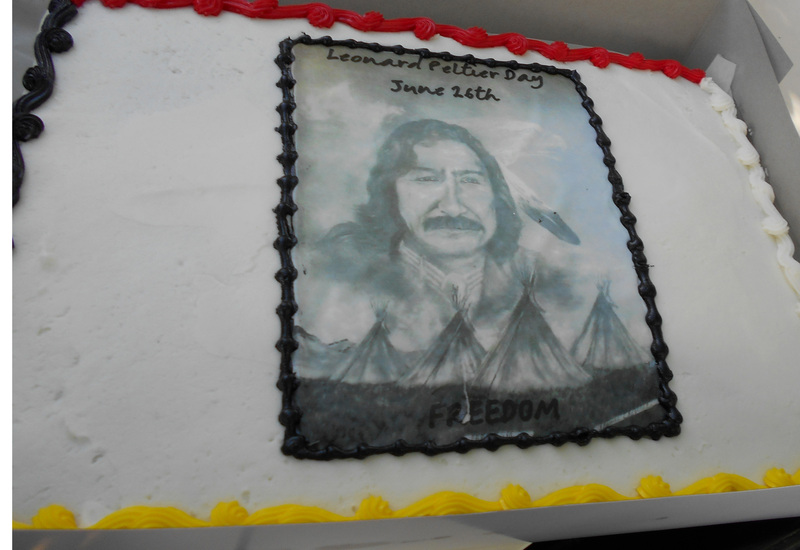 The highlight of the cakes was a reproduction of Tom Cheyenne's portrait of Leonard that graced the largest cake as well as this year's badge. 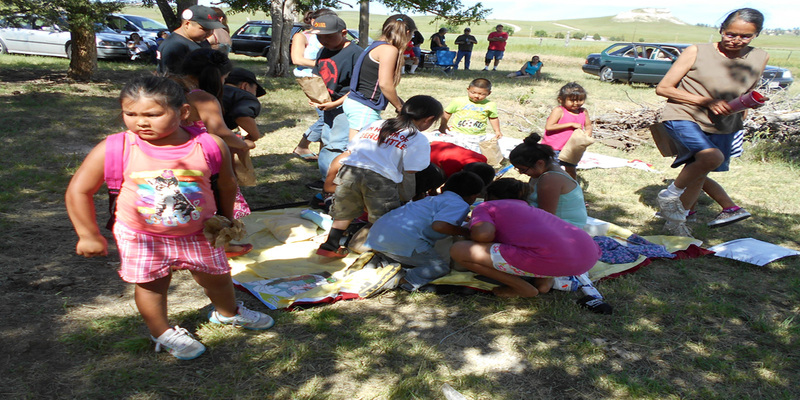 The culmination of the event at the Jumping Bull property was the children's giveaway. The children recieved book bags stocked with school supplies as well as toys and candy.. Adding to the giveaway, small household items were as well given. our sincere apologies for falling to recognize the individual or family responsible for these gifts; in the flurry of activity we failed to notice who brought these gifts. Please accept both our aplogies and our thanks. Obstacles and challenges never seem to cease in putting this event together. The Committee works through these as best as we can given the circumstances and has to remain flexible to meet the challenges and thanks the musicians for their understanding. The concert began late, kicking off this year's Youth Concert: the OGBand rocked us with some classic tunes. Scatter Their Own got us up out of out seats, and SpyderZback honored Leonard by incorporating his words into their performanace, finishing off by a rousing honor song for Leonard, sung by Robert Waters. We ran out of time and there was a mix-up in the ending lineup, and we wholeheartly apologize for this, it was not our intention to slight anyone. Shadow Nation played and rocked eeh house with a spirited performance. 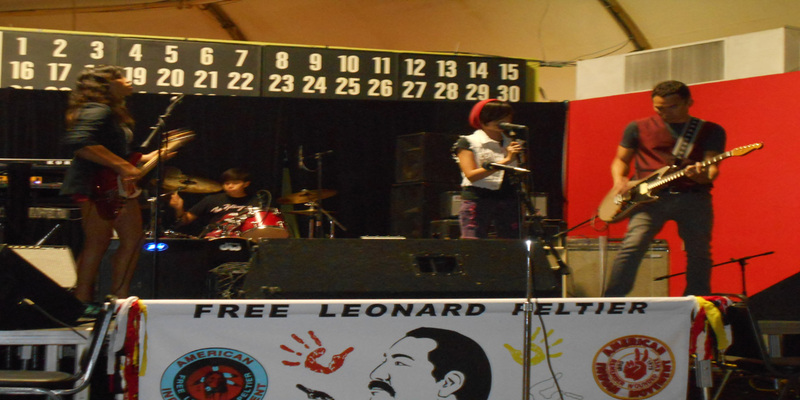 Followed by the Black Owl Society featuring Pte with special guest Wanbdi back on drum was our concluding act. 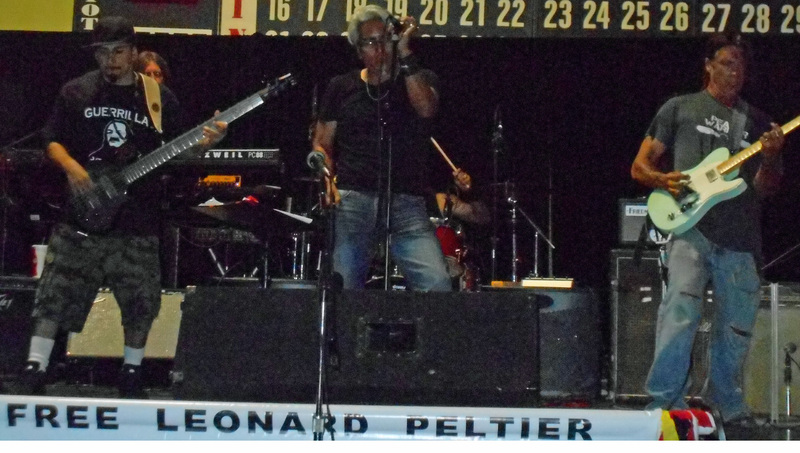 Their rocking blues was soulful, on the spot and provided a thought provoking message that natives too can rock, As an aside, it was nice to see the Zephier family once again. 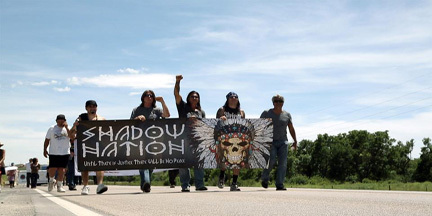 On the 27th, Marjorie Black Elk and Kevin Two Bulls opened their homes for Shadow Nation to do a video shoot, with the buttes serving as a back drop. many thinaks to the two families all all who particiated in helping and welcoming our guest Shadow Nation to shoot their video that we can't wait to see. It was pretty cool to watch the creative process an all the hard work that goes into a film production. 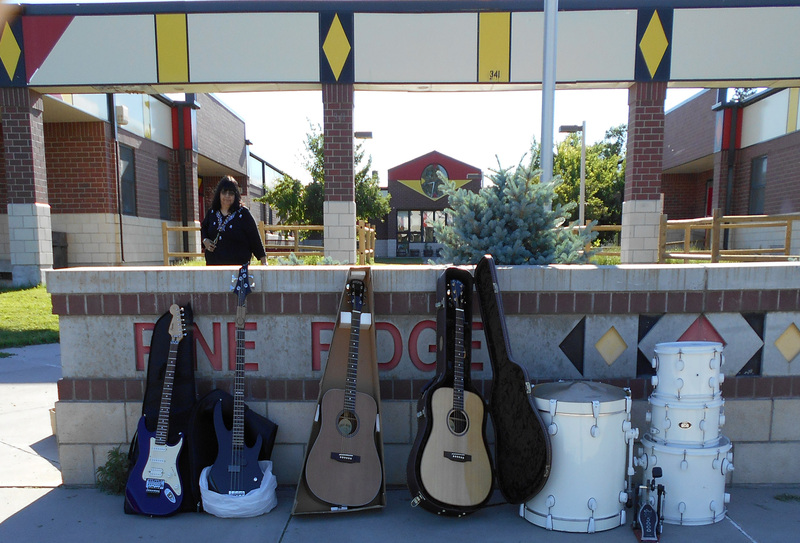 Shadow Nation prior to their departure , on June 28th, donated a supply of ESP electric guitars & bass, acoustic guitars and a drum set to the Pine Ridge High School music department. 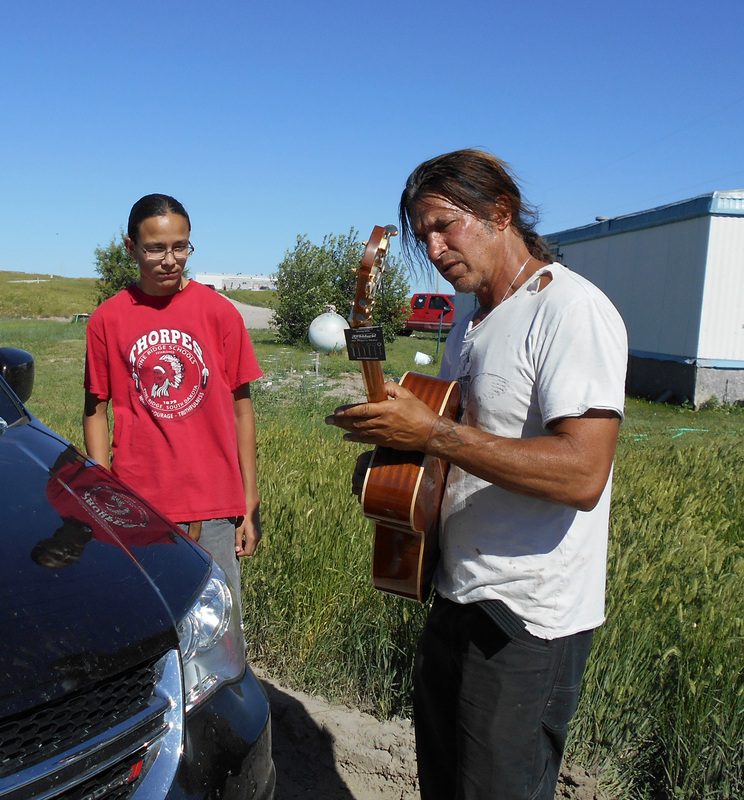 George Lynch personally met with two promising area youths, BJ and Mark. George presented each with a guitar and provided them words of encouragement . We thank Shadow Nation for taking time to meet the community. All in all it was a great fun week, we would like to thank everyone, all those who worked on the Proclamation: President Brewer, VP Tom Poor Bear, Eileen Janis and most especially Keith Rabin. 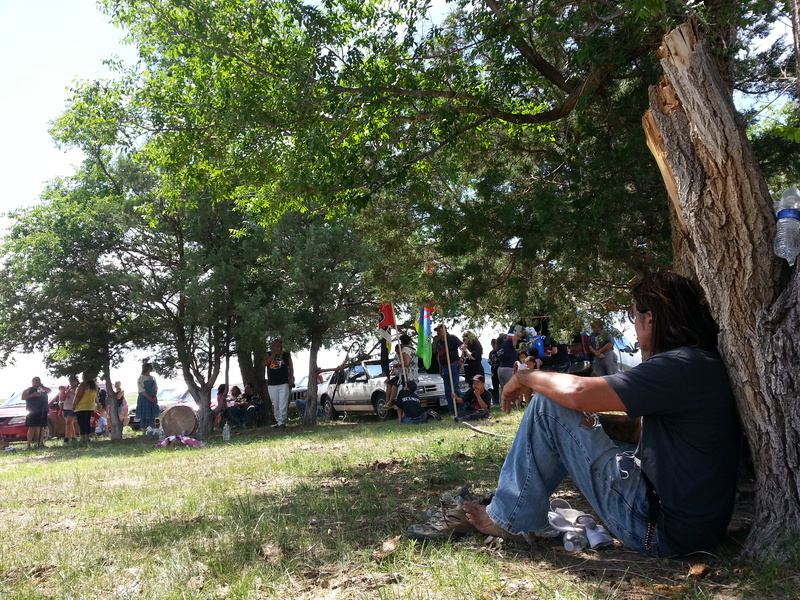 All the Families locally involved: Jumping Bull, Black Elk, Good Voice Elk, Dull Knife and Shield family. We would also like to say thank you to Greg Analla for sharing words and prayers in his own Pueblo lanuage, reaching out across the Nations. 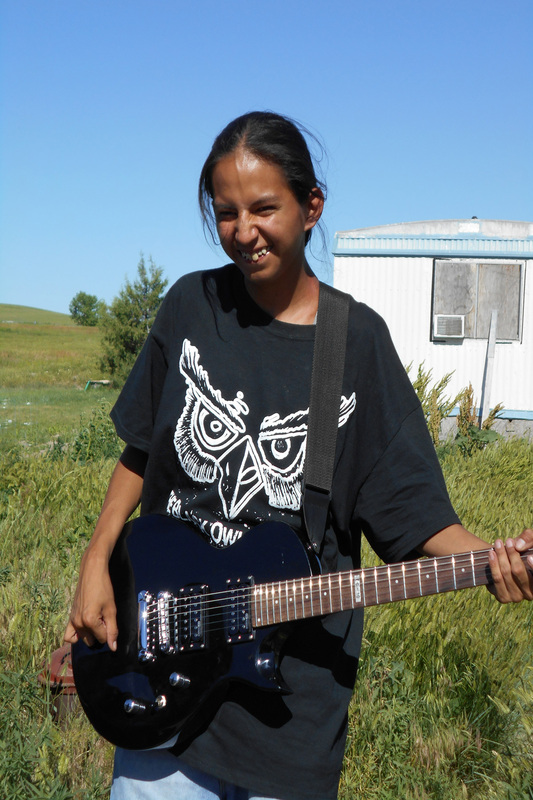 Thansk also too: AIM Grassroots, LP-DOC, Prairie Wind Casino & Hotel, KILI Radio, Wal-Mart-Chadron, Our Lady of the Sioux, Rez West Productions, Cakes & Etc- Chadron. And those who do all the work behind the scene, you know who you are, amd so do we. I also want to thank my family for always welcoming us in and our guest. Pilar Robideau, Parchcorn Family. Wahwassuck Family, Renee and Alan, GAL,All those who supply auction item to all those who place bids. 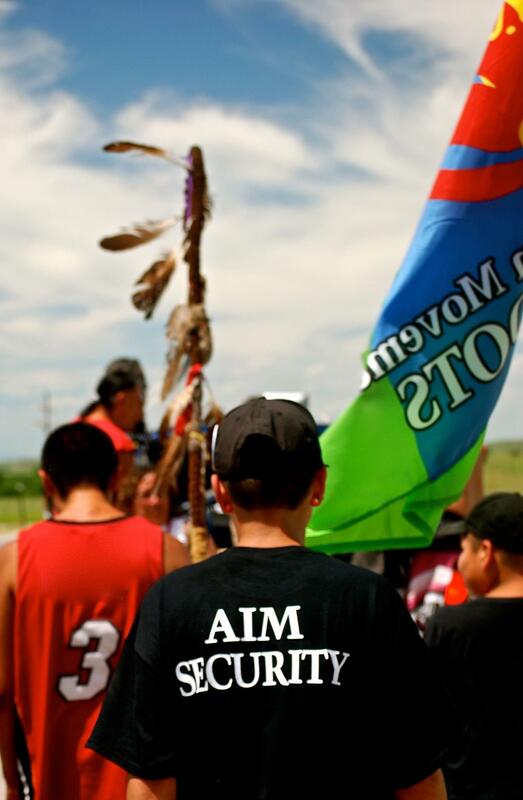 To our security: Elgin Young Bear, Wylene Two Lance,Terry Two Lance, Hattie He Crow, Kendall Brough Plenty., Jess Cross, Jamie Goings, Krisan Black Elk, Robert Poor Bear. As always our musicians come out to support this youth event in the hopes of getting Leonard's message out. 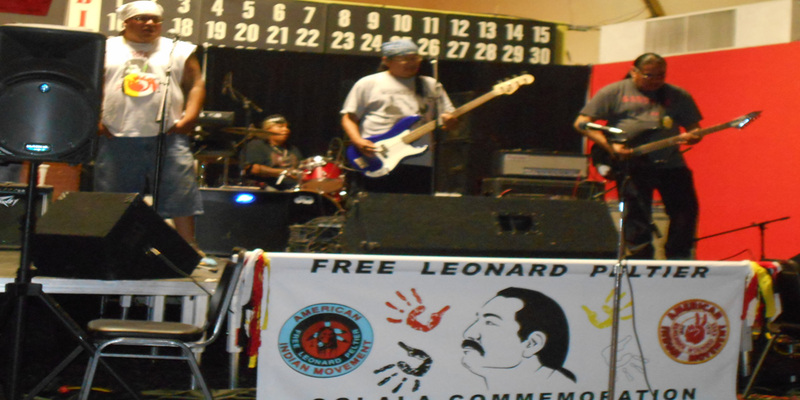 Last but not least, we wish to thank Leonard Peltier for the sacrifie of his freedom, his faith and belief in the youth and his continued support of our efforts on his behalf.